I love jalapenos. I love jalapeno poppers even more. There's nothing like sitting in a bar, watching your team win Superbowl XLIII and chomping into some greasy, cheesy jalapeno poppers. 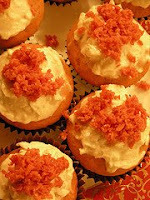 For some reason, all my friends still thought I had lost my mind with this cupcake idea. I guess my creation of the Pizza Cupcake might have bypassed a few people. I mean, would you really expect anything less? 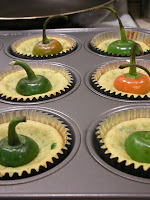 With Pizza Cupcakes as my first official entry to the Iron Cupcake: Earth competition (voting begins May 30th), I decided that it was definitely worth a try to incorporate Jalapeno Poppers into another cupcake. As I mentioned two days ago, I'm officially placing myself in the running for the Iron Cupcake:Earth competition this month. The theme is Savory Cupcakes and I'm bringing the Pizza. Yes, I said it. Pizza. So far, the general reaction to my icebreaker of "I made pizza cupcakes this weekend" has been silence. I believeI have found the way to steal words out of just about everyone's mouths. I didn't know it would be that easy, actually. Now I know what you're thinking. What the...? Who would eat that? Originally, this fiasco came about when I started thinking about my friend Marcia and her unmatched passion for pizza. And then it hit me and I thought...you know, I could make that into a cupcake. At the time, I had absolutely no idea how I would do this, of course, but therein lies the fun and challenge of the competition.